Greg Orange, Adam Jansen helped Andrejs Prost celebrate his birthday in style, taking down Peach Garden Oath to claim victory at Grand Prix San Antonio! More than 500 teams showed up to Grand Prix San Antonio to compete in the GP debut of Team Unified Modern, but anyone making a prediction would have expected third-ranked Owen Turtenwald, No. 6 Reid Duke and Hall of Famer William “Huey” Jensen to make the finals. What they may not have called is their squaring off against Greg Orange, Adam Jansen and Andrejs Prost once they made it there. 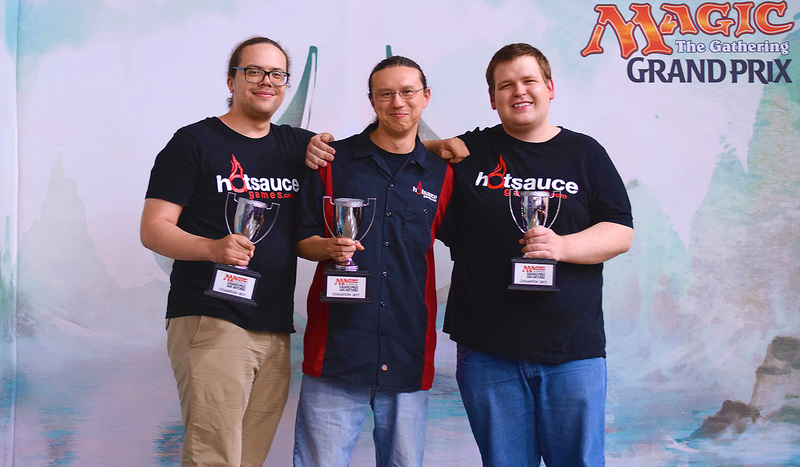 But the underdog role served the trio well, and with a wild final game that saw Prost and his Affinity deck fight through Stony Silence, the trio took home the trophies in Texas. The event showcased a number of new and revamped Modern decks, as teams worked within the unique restrictions of the Team Unified format to try and gain the upper hand. But in the end it was the steady selections made by Orange, Jansen and Prost (White-Blue Control, Jund and Affinity) that were enough to carry the day. More than 500 teams – and more than 1,600 players - showed up to compete in Grand Prix San Antonio, but just one finished Saturday with a perfect record. That honor goes to the Meddling Mage himself, Chris Pikula, who teamed up with Jarvis Yu and Ben Seck to roll their way to a perfect Texas Saturday. As the sun dawns on Day Two, the trio starts atop the field, but that field is loaded. Over 50 teams have return to battle for the chance at the Top 4, and they’re all gunning for the teams at the top. In the Grand Prix debut for Team Unified Modern, we’ve seen a plethora of decks so far, but the cutthroat gauntlet that is Sunday at a Grand Prix will ensure that only the best rise to the top. Who and what will that be? Tune into Twitch.tv/Magic to find out. More than 500 teams showed up to compete in Grand Prix San Antonio, but just one finished Saturday unbeaten. That honor goes to the Meddling Mage himself, Chris Pikula, who teamed up with Jarvis Yu and Ben Seck to roll their way to a perfect Texas Saturday. There are 128 teams who will return to battle on Sunday, as the Team Unified Modern format continues to evolve. We saw a wide variety of Decks on Day One, as the unpredictable format delivered with surprises and shocks (and even a miracle… Bonfire) in San Antonio. Who will rise to the top on Sunday as we march toward the Top 4? Tune into Twitch.tv/Magic to find out. The hashtag for Grand Prix San Antonio is #GPSanant. Join the conversation!